· How is the Kaal Sarp yog formed ? · Why is the Kaal Sarpa yog formed? Kaal means death and Sarpa means snake. The person born under Kaal Sarpa Yog passes through sufferings and agonies throughout the life. The Kaal Sarpa Yog is formed when all the planets are situated between Rahu and Ketu. 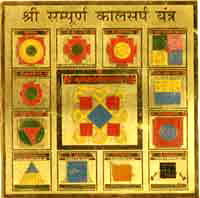 Kaal Sarpa is of 288 types Few of them are Karkotak Kaal Sarp Dosh, Ekdant. The effect of each one varies. Hence a detailed and thorough analysis is to be conducted to demarcate its effect. How is the Kaal Sarp Yog formed ? If all the seven planets come between Rahu and Ketu then Kaal Sarp Yog formed. If rest seven planets come in between Rahu & Ketu then it is not good. The person who takes birth in Kaal Sarp Yog suffers from various problems like child problems, loss in business, family problems etc. Rahu is known as snack and Ketu is its tail. All planets comes under the execs of Rahu & Ketu because of which Kaal Sarp Yog is formed in horoscope. This Kaal Sarp Yog can be formed in any person's horoscope and those who have Kaal Sarp Yog in their horoscope, inspite of having all kind of facilities they will always suffer from tension, fear, insecurity.Just like a person bitten by snake cannot sit comfortably similarly a person who has Kaal Sarpa Yog in his horoscope always fear from death. Why is Kaal Sarp Yog formed? Kaal Sarp yog is more dangerous than other malefic yoga. Kaal Sarp Yog effects a person till 47 years and some time throughout his life, its depend upon the position of Kaal sarp yoga. If all the planets are placed between Dragon’s-head (Rahu) and Dragon’s- tail (Ketu), it is considered to be a Kaal Sarp yoga. According to Indian astrology, there are many types of Kaal Sarp yoga. If inauspicious planets like Mars and Saturn are placed on the opposite side of ‘Rahu’ and ‘Ketu’, then it is considered to be a partial Kaal Sarp Yoga. If in horoscope all 7 planets are between Rahu and Ketu but partially few planets are outside the axis of Rahu and Ketu then Partial Kaal Sarp Yog is formed. If only one planet is outside the axis of Rahu and Ketu then also Partial Kaal Sarp Yog is formed. According to the situation of Rahu in 12 houses of horoscope there are Kaal Sarp Yogas of 12 major types. The Kaal Sarp Yog is further categorized into two types- Uttari Golaardh Kaal Sarp Yog and Dakshini Goalaardh Kaal Sarp Yog. It is believed that if all the 7 planets are eaten away by Rahu's mouth then it is Ascending Kaal Sarp Yog. If all planets are situated in back of Rahu then Descending Kaal Sarp Yog is formed. This Kaal Sarp Dosha is formed when Rahu is in the ascendant and Ketu in the seventh house. This Kaal Sarp Dosha is formed when Rahu is in the fifth house and Ketu in the eleventh house. This Kaal Sarp Dosha is formed when Rahu is in the ninth house and Ketu in the third house. This Kaal Sarp Dosha is formed when Rahu is in the second house and Ketu in the sixth house. This Kaal Sarp Dosha is formed when Rahu is in the sixth house and Ketu in the twelfth house. This Kaal Sarp Dosha is formed when Rahu is in the tenth house and Ketu in the fourth house. This Kaal Sarp Dosha is formed when Rahu is in the third house and Ketu in the ninth house. This Kaal Sarp Dosha is formed when Rahu is in the seventh house and Ketu in the ascendant. This Kaal Sarp Dosha is formed when Rahu is in the eleventh house and Ketu in the fifth house. This Kaal Sarp Dosha is formed when Rahu is in the fourth house and Ketu in the tenth house. This Kaal Sarp Dosha is formed when Rahu is in the sixth house and Ketu in the second house. This Kaal Sarp Dosha is formed when Rahu is in the twelfth house and Ketu in the sixth house. A person having a KaalSarp Yoga in his horoscope faces problems of instability in his life, defamation, problems in progeny, mental disturbances. A person affected by KaalSarp Yog will see Panthons and Sanakes in his dreams. A person affected by KaalSarp Yog has to struggle all through his life. KaalSarp Yog negates the positive effects of the house where it starts and ends. This way the benefit one is supposed top get is completely stopped. The native having KaalSarp Yog suffers from mental unrest, hurdles in gain of wealth, barriers in having children and uninterrupted disputes in married life. Usually the native sees bad dreams and there is danger of sudden death. Different fears and worries persist. For Example, If someone has a KaalSarp Yog affecting the First and Seventh house it will cause him prolonged illness and will adversely affect his/her relationship with his/her spouse. - Kaal Sarp dosha with Rahu in first house and Ketu in 7th house: Downfall, loss of position and reputation, mishappening, marital discord, loss of wife and children. - Kaal Sarp dosha with Rahu in second house and Ketu in 8th house : Reduction in wealth and health causes poverty, worries defects in body and lot of travelling. - Kaal Sarp dosha with Rahu in 3rd house and Ketu in 9th house : Involved in criminal activities, unpopular, waste energy and wealth, selfish, accident prone and paralysis is possible. - Kaal Sarp dosha with Rahu in 4th house and Ketu in 10th house : Loss of property, disappoint-ment, loss of job and business, unhappiness, sarpdosha unhappy and unsettled life. - - Kaal Sarp dosha with Rahu in 5th and Ketu in 11th house : Heavy losses in litigation, failure in love affair, loss of children and betrayal by friends. - - Kaal Sarp dosha with Rahu in 6th house and Ketu in 12th house : imprisonment, secret enemies, bad health and serious sickness and set backs in married life. - Rahu in 1st house: KaalSarp Dosha effect lasts up to 27 years of age. - Rahu in 2nd house: KaalSarp Dosha effect lasts up to 33 years of age. - Rahu in 3rd house: KaalSarp Dosha effect lasts up to 36 years of age. - Rahu in 4th house: KaalSarp Dosha effect lasts up to 42 years of age. - Rahu in 5th house: KaalSarp Dosha effect lasts up to 48 years of age. - Rahu in 6th house: KaalSarp Dosha effect lasts up to 54 years of age. Our Special & customized Kaal Sarp Niwaran Report. This report guides you completely about the type of Kaal Sarp Dosh you have in your Birth Chart and suggests assured & accurate remedial measures through Kaal Sarp Rudraksha, Prayers, Kaal Sarp Yantra & Kaal Sarpa Anushthaan and Homam.